⦁ Severe weather (heat, drought or heavy rains) can exert pressure on exterior ants to move indoors. Seal holes and treat the exterior before the weather changes. ⦁ Keep a written history of the locations of the ants, the nests and the trails. The chemical trail left by ants can remain for over a year and draw new ants to the same area. ⦁ When a new housing development is created, landscapers are quick to insert exterior plants that are intended to grow over the next decade or longer. Initially, a few species of ants favor such vegetation. As time progresses, the landscaping changes, and different ant species can dominate an area. ⦁ Invasive species throw the entire “balance of nature” out of whack. Where I live in Florida, red imported fire ants (Solenopsis invicta, also known as RIFA), drove out native species. Then big-headed ants (Pheidole megacephala) came in and set the RIFA back so that they are no longer the dominant species. Carpenter ants (Camponotus spp.) are the predominant species in a hardwood forest. They play an important role in the balance of nature, but when they invade a structure, it becomes a pest problem and requires control. 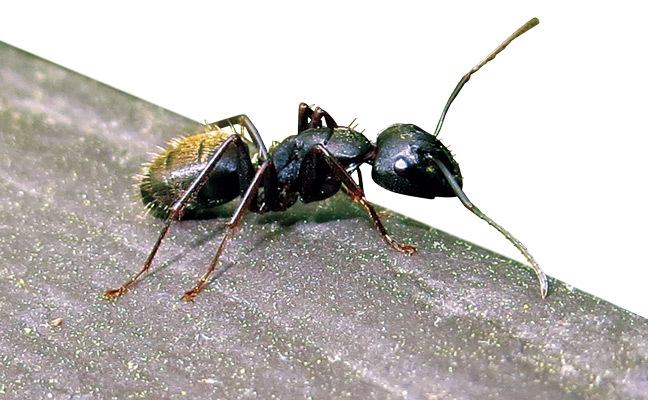 In the 1960s, carpenter ant jobs went for about $50 to $75. When dichlorodiphenyltrichloroethane (DDT) was used as an aerosol spray for gypsy moths, it also kept carpenter ant populations down. With the use of DDT banned in the U.S. in 1972 and the increase of urban sprawl into forest areas, carpenter ant jobs increased. At the same time, the price of doing this work jumped considerably — up to $400 per home. How did this happen? I recall a pest management professional in the 1970s presenting at a state association meeting. He explained to attendees how he was doing a comprehensive job and getting higher prices by power-dusting pesticide in the attic and wall voids. At that time, it was acceptable. During a carpenter ant inspection, pull back any grass growing along the foundation to help find ant trails. Use binoculars to look for ants crawling on telephone wires. Before treatment, use puffs of air to help flush out carpenter ants. Then you can treat below the bottom layer of exterior cedar shakes. Be sure to pest-proof openings into the house, where pipes enter. Interestingly, baiting for carpenter ants outside, without once going onto the structure, can work. Doing so in the early spring often results in excellent success. If you find a nest indoors, you can vacuum it up. You also can use sticky traps with a small amount of honey to help determine where activity is occurring. If you can pinpoint the area void where ants are suspected, a small amount of pesticide dust labeled for such use works well. Feed pet dogs and cats during the day, and remove the food before dusk. Pick up pet waste outside. Trim branches and shrubs so they do not touch the house. Do not place thick mulch close to the house. Store firewood up off the ground and away from structures. Keep a tight lid on the garbage can.